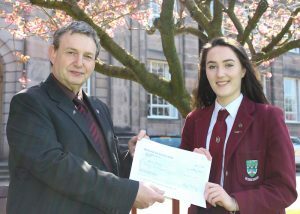 Beth Moran receiving her prize cheque from Alan Staff, CEO Apex Scotland and competition judge. We ran our first competition for Advanced Higher Modern Studies students this spring with the following challenge. “There will be a new Scottish Parliamentary session beginning after the election in May 2016. Write an email or letter to the new Cabinet Secretary for Justice in which you give advice on what his/her priorities should be over the next four-year term”. The winning entry by Jodie White of George Watson’s College, Edinburgh will appear in our June issue: Stuart Anderson of Mackie Academy, Stonehaven, and Beth Moran, also of George Watson’s, were runners-up. This is Beth’s letter: Stuart’s letter is here. While I’m sure you are perfectly aware of the problems which our Criminal Justice System is currently facing, there is one issue in particular which I would like to draw your attention to; the imprisonment of children. It is well known that young people of or under the age of 18 who serve custodial sentences, become significantly more likely to repeatedly reoffend than those who are dealt with outwith the prison service. 67% of under 18’s go on to reoffend within a year of release. They are also more likely to sustain a longer and more serious criminal career than those who are imprisoned at a later stage. When a young person is locked up far away from their friends and family, often only being visited just once a week, their emotional and mental state is severely affected. Considering that upwards of 26% of female young offenders have had a history of suicidal behaviour prior to their incarceration, it seems to me that imprisoning them is not the best solution to their behaviour as these tendencies are only exacerbated by separation and the trauma of adapting to prison life. The reasons young people commit crime can differ greatly from the reasons older people partake in criminal activity, so why is it that we choose to punish them in the same way? Surely this is not the right response. As you know, there are numerous non-custodial alternatives which prove to be highly successful in tackling the issue of repeated young offending. I feel that a wider use of restorative justice, in conjunction with rehabilitation programs and education programs for those who need them, could help to drastically reduce the rate of recidivism for young people in this country. Studies done on restorative justice and its effects highlight and further stress the beneficial and successful nature of the process. Those criminals who partook in restorative justice were found to be 14% less likely to reoffend than those who did not. Not only does restorative justice aid the offender by educating them about their wrongdoings and allowing them to apologise for the effects of their crime but it also helps in providing closure for the victim. 87% of victims who took part in a restorative justice program found it to be extremely helpful in coming to terms and dealing with the crime perpetrated against them. Community payback orders also provide a much more influential and useful punishment to young offenders than incarceration. Many of the vulnerable young people who are convicted benefit greatly from the routine instilled in them through a community payback order as well as the work ethic encouraged. With one of the leading causes of criminality being unemployment and poverty, community payback orders can play an instrumental role in helping these young people develop skills and abilities which will aid them in being able to find work. Not only do community payback orders help in this way, but they also prevent young offenders from tarnished with a criminal record for a mistake or wrongdoing they made as a youth, for the rest of their lives. As you are well aware, after one custodial sentence is served by an individual, they can very easily fall into the repeated cycle of crime as they struggle to gain employment and build strong healthy relationships, as a result of our society’s attitude towards those who have criminal records. I feel that it is imperative that we do all that we can as a country to help our vulnerable young people and prevent them from becoming trapped in a life of violence, poverty and crime. Of course there will always be individuals whose crimes are so severe that there is no other alternative than to sentence them to a period of imprisonment. When this is the case however, I feel that much more needs to be done in relation to improving rehabilitation and education services for young people. Many young offenders admit to being addicted to either drugs, alcohol or both and we must endeavour to do all we can to help them rehabilitate and form healthy lifestyles. I trust that you will take all that I have mentioned into consideration when developing new policies and amending old ones, with relation to young offenders and the part prison has to play in their rehabilitation and punishment. Beth has been a student at George Watson’s, Edinburgh, and hopes to go to the University of Leeds to study History of Art. She is interested in current affairs and how they have influenced art throughout the ages.